The Blue Heeler is an Australian working breed. They were traditionally used for driving cattle along by nipping at their heels—hence the name. Welcome to our complete guide to the Blue Heeler. Find out what’s so special about the Australian Cattle Dog! Check out the Blue Heeler’s temperament and learn about Blue Heeler health issues. Ultimately, discover whether or not this is the perfect dog breed for your family. TIP: Australian Cattle Dog is simply another name for the Blue Heeler. Both names are completely interchangeable. You’ll also sometimes hear the breed referred to as the Queensland Heeler or Red Heeler. Don’t worry—it’s all one and the same. So let’s dive in and find out more about them. Like every other working dog, the Blue Heeler loves and needs lots of exercise, and is very intelligent. Their intelligence, loyalty, and striking looks have made this cattle dog an increasingly popular breed. The Australian Cattle Dogs were bred to create a herding dog. This was especially for the Australian environment after British settlers emigrated there in the 19th century. Their unique appearance is partly down to the wild dingo blood running through their veins. Archaeological evidence shows that wherever Dingos and domestic dogs have existed in close proximity, a certain amount of cross breeding has occurred. However, it’s no coincidence that Blue Heelers are somewhat dingo-like in appearance—the dingo blood in the Australian Cattle Dog is no accident. In fact, dingos were deliberately bred with the Blue Heeler dog to create a specific result. That is, the kind of tough dog that Australian cattlemen needed. In addition to Dingos, you’ll find traces of other breeds in a Blue Heeler’s genetic makeup. These include the Blue Smooth Highland Collie, Bull Terrier, Dalmatian, and black and tan Kelpie. If you’d like to find out more about the history of this fascinating breed, check out our detailed guide to Blue Heeler origins. The breed received official recognition in 1980 by the American Kennel Club. Since then, a set of standards have been drawn up for the characteristics you can expect in Blue Heeler dog. We’ll look at those soon, but first, some fun facts. We love learning fun facts about our fur children. We’ve compiled a bunch of cool facts about Australian Cattle Dogs. You can now learn everything from the oldest Blue Heeler dog to celebrities with Australian Cattle Dogs. Let’s get started! The current oldest dog ever according to Guinness World Records is an Australian Cattle Dog. 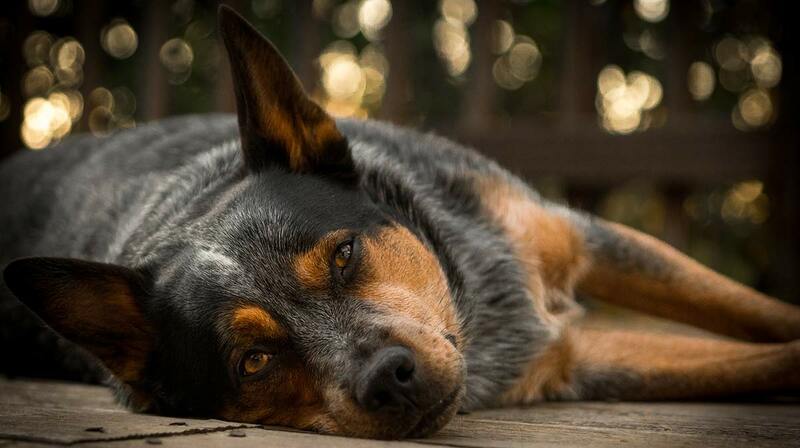 The Blue Heeler dog, Bluey lived for 29 years and 5 days. Like their Dalmatian relatives, Blue Heelers are often born completely white. Now let’s look closely at the appearance of the Blue Heeler dog. Healthy adult Blue Heelers can weigh anywhere between 30 and 50 pounds. Where height is concerned, they can be up to 20 inches tall. Usually, though, females are smaller than males. With upright ears, short fur, and a balanced, athletic body, the Blue Heeler resembles the Australian Dingo. However, the main difference is that their bodies tend to be more muscular. It’s worth noting that their ears may be initially floppy as puppies, but often become perky before 24 months. The Australian Cattle Dog has a short, straight coat with many different shades. They also have an even shorter undercoat. Their fur is relatively rough to the touch. This is useful as it protects them from harsh weather conditions like rain or extreme heat. This breed comes in two main colors—red or blue. The redder Blue Heeler dog is sometimes known as the Red Heeler. However, the markings and patterns covering the fur vary depending on the individual dog. They can often leave the dog looking like a mixture of the two colors. It is also common (and very cute!) for Australian Cattle Dogs to have a mask of darker fur over one or both eyes. Breed temperament goes here: Natural instincts relevant to group and to individual breed, how co-operative is the breed, how independent, tendencies to guard, or chase. Tendencies to aggression (link to sources) or bite, bite style and jaw strength where appropriate. The Australian Cattle Dog is a tough breed both mentally and physically. A 2007 study tracked Blue Heelers and other cattle dogs engaged in mustering sessions lasting four hours or more in temperatures of up to 38 degrees celsius. During the sessions, these dogs covered average distances of up to 20 miles. Blue Heeler dogs also come with strong herding instincts. —a testament to their natural intelligence. However, this can result in them trying to herd other animals or even children as they run around! That’s why it is so important to get your Blue Heeler used to a variety of people and animals from puppyhood. Like many herding breeds, the Blue Heeler is very loyal and can be quite protective of its family and toys, but wary towards strangers. Plenty of early socialization helps to reduce the “wariness” but won’t dispel it altogether. So the chances are your Blue Heeler dog will always be somewhat cautious around strangers and prefer familiar faces. Like many tough breeds, Blue Heelers are independent dogs who need to be well socialized from a young age. Because Australian Cattle Dogs are so intelligent, they require activities that stimulate them physically and mentally to take up their spare time. Positive reinforcement training is a must for this clever and enthusiastic breed. Activities and games such as retrieving and tracking will maintain the focus and quick responses of your dog. Without things to do, your pup may get bored and could start misbehaving to occupy itself. Australian Cattle Dogs are an extremely intelligent breed, that take quickly to training, as they would have to when learning to herd cattle. Clicker and reward-based training is a great way to train dogs like these, and goes hand in hand with proper socialization in the first few years of your dog’s life to ensure an obedient, friendly dog later in life. These dogs are agile and do not tire easily—all qualities that make them such great herders. Getting enough exercise is only one part of keeping them fit, though. It is also crucial to avoid overfeeding. This will help prevent obesity and promote optimum health. In the next section we’ll look at some of the health issues that can arise in this breed. It’s important to be aware of health issues that may affect your favorite breeds because in some cases, these can be entirely avoided by proper health testing. And in others, early diagnosis offers a better outlook for the dog. But what about Blue Heeler dogs? What are their health issues? Well, first off, like many purebred dogs, Blue Heelers are prone to inherited eye troubles. Progressive Retinal Atrophy (PRA) causes slow, painless loss of sight until these dogs are completely blind in both eyes. This can take as long as several years or as little as several months. Fortunately, we now have tests which can identify dogs carrying the PRA gene, and there is no reason today why any puppy should develop the most common forms of this disease. All reputable breeders use these tests to screen their breeding stock. So, your main defense against PRA is finding a responsible breeder. Another eye disease that these dogs can suffer is lens luxation. In this condition, the lens of your dog’s eye separates either partially or completely. There are various treatments for this disease at different stages. However, after treatment, your dog will require regular check-ups. Australian Cattle Dogs are also prone to common diseases that affect the joints of many dog breeds. For example, they can experience canine hip dysplasia. This is where the hip joints do not develop properly and grind together rather than moving smoothly. Depending on the severity of their condition, an affected dog could require surgery or physiotherapy. Screening is helping to reduce the incidence and severity of this disease, but testing of breeding stock is an essential part of this process. Another joint disease that often affects Australian Cattle Dogs is elbow dysplasia, which may also require surgery. A final major disease that Australian Cattle Dogs are prone to is Osteochondritis Dissecans (OCD). This causes your dog to have excess cartilage and deficient bone since cartilage does not get replaced as it should by bone during fetal development. OCD usually requires corrective surgery or prescribed medicines. These diseases can be really distressing for an Australian Cattle Dog because they obstruct the exercise that this breed requires to stay happy and fit. The risk of joint problems can’t be eliminated entirely by health testing, because these diseases don’t have a simple, clear cut mechanism of inheritance. They’re also influenced somewhat by environmental factors such as diet and exercise. So, instead of a gene test, parent dogs are tested for early signs of the disease. Then they’re given a score that good breeders use to select their breeding stock. Avoiding hard exercise while he is still very young. 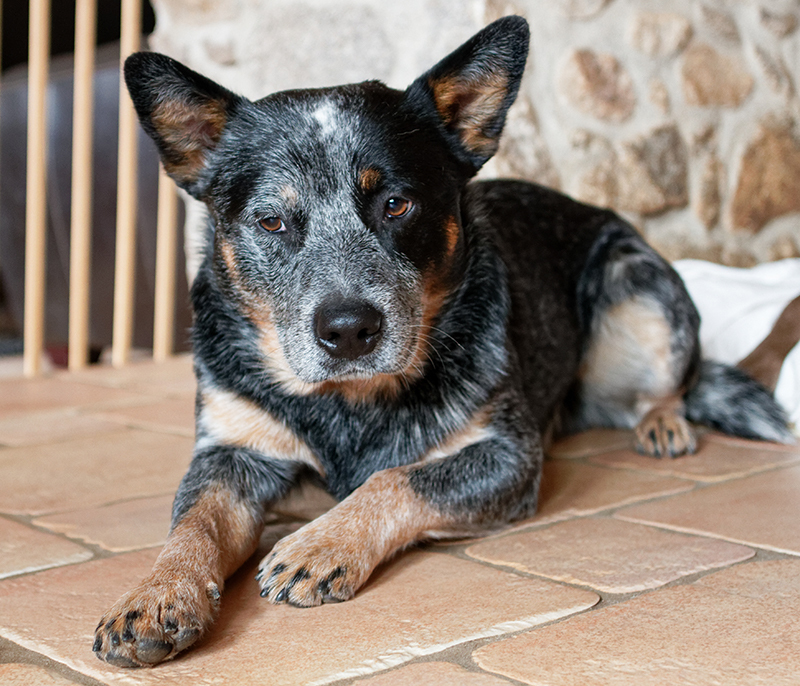 Australian cattle dogs suffer from congenital hereditary sensorineural deafness (CHSD). In a study of just under 900 Australian cattle dogs, published in 2012, over 10% of Blue Heelers had some degree of deafness. 3% of all the dogs were deaf in both ears. An association between coat color and deafness has been noted in several breeds but the pattern and mechanism of inheritance is not always the same. In Blue Heelers, dogs with masks and females were at higher risk than dogs without facial masks or male dogs. In Australian Stumpy Tailed Cattle Dogs, which are related to Blue Heelers, some association has been found between speckled markings in the coat and deafness. However, a link between coat markings/color and hearing has not yet been proven in Blue Heelers. Many owners of deaf Blue Heelers have learned to use signs to communicate. But if you’d prefer to avoid purchasing deaf Blue Heeler puppies, visit a knowledgeable breeder. Bilateral deafness can be identified by an experienced breeder by about six weeks of age. Blue Heeler puppies with deafness in only one ear are harder to detect, but also less of a challenge to train and care for. One further health problem we should mention is a condition that causes abnormalities of the blood flow in the liver. The liver is an important filter and removes toxins from the bloodstream. This keeps your dog’s blood clean and healthy, just as it does in people. A portosystemic shunt means that the blood flow is literally “shunted” back into the bloodstream instead of passing through the liver. So the liver never gets a chance to remove those toxins, and the organ itself fails to grow properly. Dogs with a liver shunt may fail to thrive and suffer a range of symptoms. Therefore, it’s very important to consult with your vet if your puppy is not growing as he should or seems unwell. Early treatment is important. The Blue Heeler has a reasonable lifespan for a purebred dog. Different sources tend to give different estimates of longevity but few of them are based on hard evidence. However, the Kennel Club in the UK has been collecting some data by sending questionnaires out to dog breeders and owners. A study published in 2004 included 22 blue Heelers. The dogs that had died (eleven of them) reached a mean age of twelve years. The oldest of those eleven dogs lived to be sixteen years of age. With such a small sample we can’t draw any firm conclusions, but this is a breed with a sound conformation. So, hopefully, your Blue Heeler will be with you for a decade or more. Also keep in mind that not all health problems impact on a dog’s potential lifespan, of course. It always helps too to feed your Australian Cattle Dog nourishing food. Australian Cattle Dogs shed a lot of fur, but the coat is relatively easy to maintain and care for. You should groom your Blue Heeler regularly to remove old hair and encourage new growth. This will help to reduce the amount of hair shed onto your carpets, but it won’t prevent shedding altogether. For baths and other care, Blue Heeler dogs are pretty low maintenance. You can bathe them as needed. There are over 80 different diseases in dogs for which we have DNA tests available. Still, that number continues to climb. There are also many diseases for which there are no tests. We can’t list them all here, and likely only a few will affect your chosen breed. And remember to check with the AKC on the latest health tests available for your breed before you start searching for your puppy. Do Blue Heelers Make Good Family Pets? Australian Cattle Dogs make great pets if you can to give them the exercise and mental stimulation they require to stay healthy and happy. They are loyal to their owners and are full of personality and love. Generally, they’re also good with children. However, you must be wary of their inherent desire to herd—they often try to herd running children and can be prone to nip at passing legs. So whilst they can make great pets if you have the time and energy to dedicate to their healthy lives, you will need to always supervise these dogs around smaller children. Adopting a puppy is often a wonderful experience for all parties involved. We have some information on dog rescue here.And you can find some rescue societies here. Finding a good breeder for Australian Cattle Dogs is one of the most important steps you can take in your search for a puppy. This is because, as mentioned before, many health problems with these dogs are genetic. It is important to make sure the Blue Heeler puppy you choose has a healthy parentage. Be firm about seeing certificates to verify the health status of the parents before you visit (and fall in love with) a puppy. This will minimize the risk of the diseases discussed earlier in this article. Also research the potential breeders, as many people will review breeders they have used before. Always visit your breeder and their puppies before deciding. Moreso, always go to a breeder prepared to ask questions. Make sure you’re satisfied that they’ve given you enough information before proceeding. And remember never to buy a puppy without seeing it with its mother. In addition to the health concerns, you want to avoid puppy mills. Read our article on puppy mills to know what you should look out for. Good breeders will also usually question you, to make sure their puppy is going to a good home. They’ll want to know that it’s with someone who knows how to take care of it. They will also have carried out all health tests relevant to the breed and be happy to show you the supporting paperwork. Caring for a vulnerable Blue Heeler puppy is a big responsibility. There are some great guides to help you with all aspects of puppy care and training. You’ll find them listed on our Blue Heeler puppy care page. As Australian Cattle Dogs are becoming more popular, people are starting to mix them with other breeds. People love mixing dog breeds. It can be a great way to get different colored or sized Australian Cattle Dogs. Such as white Australian Cattle Dogs, or mini Australian Cattle Dogs. If you are thinking about getting one of these mixes, you also need to consider the breed it has been mixed with. While on average, longevity is improved in cross-bred dogs, a mixed-breed puppy can inherit health problems from either of the parent breeds. So you’ll still need to make sure the parent dogs have been health tested. Australian Shepherd: Compared with the Blue Heeler, this breed is very good with kids—no nipping. It’s also less energetic and stubborn. Border Collie: This breed sheds a bit less than the Blue Heeler, but is just as energetic. With a longer coat, it requires more brushing though. Entlebucher Mountain Dog: This one interacts better with other dogs. It also sheds way less, but is just as energetic. German Shepherd Dog: This popular breed is great with kids and demands less energy. It sheds like crazy though. Belgian Tervuren: This one is easily trained, but it’s long coat might be more high maintenance. As we saw earlier, many of these cons can be mitigated by proper training and socialization. You may find training videos like this one helpful. 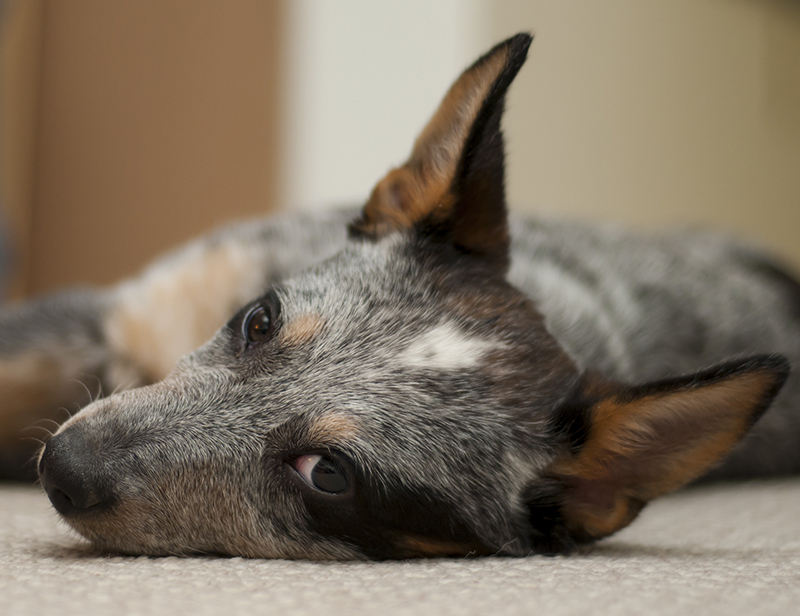 Shedding is often seen as an inconvenience, but like many other dog breeds, this is an issue you’ll need to be prepared to deal with if you are thinking of bringing an Australian Cattle Dog into your home. Investing in a good pet hair vacuum cleaner and establishing a regular cleaning routine will help to keep it under control. You can also check out some of our favorite toys for your Blue Heeler dog here. Our readers’ most popular and frequently asked questions about the Blue Heeler. Do Blue Heelers get along with other animals? Australian Cattle Dogs are generally not a very cheap breed, though prices can range from as low as $250 to $2000 in some cases. Even though prices vary hugely, a high price does not necessarily equal the best choice of puppy. It is also important to remember that if your Australian Cattle Dog does develop any diseases, like those mentioned earlier, you will have to cover the cost of treatment. Pet insurance will help protect you against the worst of these costs. How to Stop Blue Heeler Misbehaving? A few readers have reported issues like “severe food aggression” and frequent “nipping/biting.” You may find our articles on training puppies helpful. We have one on stopping puppies from biting and this for stopping the jumping habit. Bearing in mind the herding instincts of Australian Cattle Dogs, it is wise to exercise care when introducing new animals. Dog training experts recommend introducing cats or other animals in puppyhood. New animals may need to be introduced cautiously—perhaps using a protective fence at first. Is a Blue Heeler Right for Me? You need to make sure you’re prepared to give your dog the attention it will need. You will need to socialize your puppy well, and keep your pet healthy and fit both mentally and physically. It’s also vital to keep up with recommended medical checks to ensure that your puppy is growing properly. Make sure you have the time to dedicate to your dog’s training. Blue Heelers do best when they have a job to do, whether that job is herding cattle, fetching frisbees, keeping you company on your morning run, or competing in agility contests. This is a dog that needs to be busy! We’d love to hear any rescue societies you know of for Blue Heeler puppies or dogs! Please leave them in the comments. Blueys (blue Australian cattle dogs) are loyal, tough, smart but pushy. We adopted a 3 year old rescue girl. Always a risk with blueys, as mis-treated animals can be aggressive, but our girl was quiet but still traumatised by her mis-treatment as a pup. She always needed someone at home with her. Luckily we were in a position to supply this. JJ (Jade) is now 11 and still in good health if a bit white around the face. Her favourite spot is on top of a blanket box in front of our front window so she can watch (and smell) the world go by. This is part of her guarding the house. If someone is coming to the front door, she lets us know. But if we accept them, she accepts them. She has a tendency to put on weight, so a daily walk is essential. Happy to let anyone pat her – no problem at all. Just get rid of that pesky dog you’re walking. Good with children of any age as long as she is under supervision, I still wouldn’t get a bluey if you have children under five. Perfect for older children – but perhaps would be TOO protective if there were other children or people around who she doesn’t know. Did I mention pushy? When she first came home with us she tended to walk behind you and push you with her nose to get you to move on. Other blueys may nip your heels, but JJ never did that. Blueys are bred to control herds of cattle and move them about, so people are an easy gig. We’ve slowly trained her out of this, but she’s still pushy – when it’s time to get up, when it’s time for her breakfast, when it’s time for her walk – she will let you know. Typically by sitting and staring at you, but occasionally by standing in the way if you are going the wrong direction. It is REALLY bred into them to push you around. Wonderful breed if you are looking for a friend for life. My husband bought a blue heeler for me just before he died. I’m 64 and usually active, but I am very distraught during this time and not as active. I live in the city and have a large enough yard, but I’m trying to complete the cabin on 10 acres of woods so I can move there. She loves walking in the woods with me and keeps close, but I can’t take her around the house because the underpinning is not installed and she goes right for the trash, so she stays in a goat pen when I’m working. My sister is an amateur dog trainer, and her advice has helped. Reading these posts have helped, also. I’m trying to be patient, and I’ve learned how to replace sprinkler heads. She’s 6 months now, and I’m hoping she’ll be more settled soon. I’ve thought off and on about re-homing her because, frankly, I’m no fun to be around right now. On the other hand, sometimes I think if I just wait it out, things will get better, especially when I move. We have had blue heelers for over 25+ years and truly love the breed.. We currently have 3 now and the oldest is 15!!! They have all been raised with our kids and grandkids with lots of love for all of them? I would certainly recommend these beautiful amazing puppies/doggies for any family looking for a awesome family member!!! We have an 11 week old Blue Heeler. Picks up on commands/tricks VERY quickly. It’s awesomely pleasing how smart these dogs are. Already knows how to ring the bell to be let out. Wait, etc. When in the midst of bad behavior however it’s really difficult to get him to stop. Jumping on people, constantly biting/mouthing, nipping, biting the leash, and barking/growling at us are a constant issue. Wondering how other owners stopped these behaviors in their tracks. This little buddy has all the potential to be AMAZING. Would love some advice. We have an 18month old Blue Heeler, who we watched from birth (we know his parents owners), and who arrived with us as a very small puppy. Our other dog is an older (12 years) miniature poodle, who was initially slightly bigger than our new arrival. That has changed, and he is now 30kg to her 8. Beautiful, loving dog who loves cuddles, and is friendly to everyone, whether person or dog. He jumps at everyone, though, which people find scary. We’re working on that. He is hard work, though. Demanding play a couple of times a day. This is active play, with either a pull toy or, his favorite, a Kong ball. Very clever, and easy to train. He’s a joy to have around, but I would never recommend a young dog like this for anyone who can’t play with him (btw, walking him is not enough, he needs to PLAY!!!). We have two teenagers at home, and a big property, so he gets a lot of running and fetching in. Great dog, if you have the room and time. Bonjour, j’ai une femelle Bleue depuis 4,5 ans qui est géniale (bon ne jamais oublier les 2 premières années difficiles). J’aimerais savoir combien coûtait cette race en 2004 ? Pour voir l’évolution jusqu’à aujourd’hui. Nous avons payé la notre 1200€ en 2014. Tous les tests liés à la race ont été fait par l’éleveuse. Je n’ai pas trouvé d’informations à ce sujet. Hello, I have a female Blue for 4.5 years who is great (good never to forget the first 2 difficult years). I would like to know how much this breed cost in 2004? To see the evolution until today. We paid our € 1,200 in 2014. All the tests related to the breed were done by the breeder. I did not find any information about this. I adopted a 5 year old blue heeler 9 years ago. I know his age because he was a stray dog with a collar and tag. The person who found him could not keep him so he came to me. She and I contacted the vet listed on his tag. The vet verified they had seen the dog once but that any mail they had sent to the owner’s address had been returned marked “not at this address”. He is 14 now. He has been a great dog. Whoever originally had him did some very good training. Some was overboard, though. I think they may have tried to train him as an attack/guard dog. Originally, he would not let me pet him and when I would played with him, he was very rough. At that time, I had two other smaller dogs but he treated them well. Never was aggressive towards them. It took time but now, he allows me to pet him and he has gentled his play so I am not covered in bruises like I was before. He has been a very good dog. He is intelligent. Even though, he is fourteen years old even my vet comments on the fact that he shows little sign of being an older dog. I have had no regrets for adopting this wonderful animal. We got a rescue puppy who is now 7 months old and 34 lbs. Recently we had a DNA test done on her and found out she is 12.5% Beagle, 12.5% Australian Cattle Dog, 12.5% Australian Shepherd, 12.5% Siberian Husky, 50% Breed Groups Terrier, Companion and Sporting. She sheds terribly and I have never had a dog that sheds before. She’s all black with some wirery white hair her back. I brush and I brush and I’m wondering if it would be beneficial to have her hair trimmed. We live in Nebrasksa where it snows. I rescued a 5 year old deaf healer. These dogs are amazingly smart and do very well with hand signals\sign language. I disagree with the article suggesting caution adopting a deaf healer. Frankly I am now prone to seek them out. People who meet my dog have no idea he’s deaf until they see me giving signs. They are amazed he responds to signs, where I remember to share the fact he is deaf. If you are thinking of adopting a Heeler, don’t worry at all if it is deaf. It really isn’t a factor. My husband brought me home a 9 week old rescue puppy. We know that it is part Cattle dog, according to two separate vets and he looks and acts like it. Have no idea what else. Has a white tail like a husky curls. Black ears and orange along the inside ridge. Body is white with lots of ticking. But has this week, wavy soft but coarse hair down his spine. Has actually been the easiest dog to train, besides my childhood Border Collie. About 12 weeks old and knows begining basic obedience. Sit, Sit Stay, Down, Down stay, back up. Working on heel, leave it,etc. We do puzzle games,walk around my property, car rides,shopping,etc. (Likes the balls in a muffin pan game, with tennis balls on top. He loves the cattle ranch on the side of my property. He sits on the deck, watchs and smiles. He loves everyone in my home. He’s great meeting people, new sounds,surfaces,etc. My dogs go just about everywhere with me. So, definitely socializing him. I made sure it’s a positive experience for him. The people at the feed store love him. I think he has only lived outside and was possibly abused. First week would wake up crying, if he wasnt touching me when sleeping. And isn’t crying if wakes up without touching me. Now I hold the bowl and can handle the food or him. Haven’t graduated to bowl on the floor yet or having animals in the room, without a reaction. If the animals not eating together doesn’t happen. We’ll just do what we do now, gate in the kitchen separating them. Have had a few successful days with it on the floor, breifly handling him or the food. He plays extremely rough with my 3 year old pug and has broken the skin with those puppy teeth. Hasnt lost any puppy teeth yet. He’s getting better, but I never leave them alone. I think he thinks the Pug is a puppy. Yet, he bathes and sleeps with him. My grouchy 12 year old Lhasa Apso, he never plays rough with him. I adopted an 8-month-old heeler who was very red but clearly not a full red heeler because he has ears that flop over. We would spend 3-4 hours at the dog park playing fetch and he would still destroy things in my house for a few months. He has broken the habit now. He was not very food driven which made training difficult but! If I gave him the more expensive dog treats he was very receptive. He learned to sit, lay down, stay, kennel and ring the bell to go outside within two weeks. He is such a smart dog who loves to go on runs that keep me active. We frequently participate in 5k’s and different runs. I just adopted a 2-year-old American blue heeler with a mask last week. She is the most affectionate, people-pleasure, cuddler I have ever had for a dog. She is very smart and has caught onto various commands that she didn’t know. She watches him and follows what he does. They highly enjoy each other. They wrestle and play tug-a-war creating a way to expend their energy. My son purchased a beautiful blue heeler female at about 8 weeks of age. Apparently the owner docked her tail on his own and messed her up. She has no control on bowel movement and pee. He got her in hopes of taking her on his semi with him, but this problem prevented that. One vet suggested putting her down. My son couldn’t see doing that to an 8 week old puppy without giving her a chance to live. A neighbor took her, but because of their limited space, she spent a lot of time on their back porch so kept it very messy. My husband and I have her now. She is quite active. At first I got the puppy diapers, but the opening for her tail was not working out for her. I not have her in size 1 baby diapers, she seems quite happy, and often lets me know when she needs a change. I noticed today that she seemed to be wagging her tail. Could this be an indication that she could grow out of her problem and begin to have normal control? Like I said, she is quite active and loves to run in the yard. She has selected me as her human! We are considering adopting an 8 year old female blue heeler. Does this breed kill cats and/or chickens? My Heelers loved the chicks! He didn’t want to eat them, just play which really isn’t good since he was a large boy. I trained him to keep wandering cats out of the yard, but he never got aggressive, just liked to scare them. All in all, they will do what you train them to do. Just keep in mind that every personality is different. My Cattle Dog is an avid bird watcher! We have had a herd of wild turkeys walk 10 ft from his window and he just stared with fascination. He struggles with wanting to chase any squirrel he sees on his walk. But if we come across a bird; he instantly relaxes and just watches it flit around. I would recommend introducing the chickens to your new pup slowly, with a fence between if possible, and be very firm about your expectations. Even if he is more “in your face” curious than mine, they are SO smart and receptive to training that I do not see co-habituating with chickens being an issue. I had a blue heeler show up at my home in January. No owner found so I decided to keep her. The vet estimated she is about 2 yrs old. I am having the normal issues with her behavior although, I think overall she has improved some. I have a pet-sitting business out of my home and she does pretty good with all the dogs that come in. My situation is this, When she came, there were 5 other people living with me, now, its just me. I know she doesn’t get the proper amount of exercise but she seems pretty happy but extremely attached to me, she even sleeps with me now and likes to be snuggled up close. She is always wanting to lick or paw at me even when I am petting on her already and separation anxiety is a big thing with her. My real concern with her is that she only has me, would it be better for her to have a “family” environment? I ask this because she doesn’t get the socialization that she should. When anyone comes over, she is constantly barking and if you don’t watch her, she will come behind and nip. I love her dearly but I also want the best life for her. I know of a family that is interested in her but I am struggling with the decision to keep her or not. They are a family of 5. They have 3 kids, which concerns me some also. I am very conflicted, I think she was “dumped” at my house and worried that if I give her away then she will feel abandoned again. She is very fearful of a lot of things. Please, I need some advise. The best thing to do is visit the family and see how it goes. If she’s been with you for a time, she will probably not want to leave you. But, the good news is my heeler mix (most of the heeler traits) did alright when my disks collapsed. I took him to run free at a local park (with permission) three days a week. He could run his legs off and I had no problems with him running away. (Always keep ‘cookies’ on hand.) They’re usually better off-leash anyway. I rescued my Pup when he was 1 years old. This sounds very familiar. It took a lot of work, and about 2 years, for me to get him comfortable around new people. If you are constantly having new faces show up around the house, she is going to have a harder time. With Todd, especially with any man, it will take on average 6 or so times of meeting you before he feels comfortable enough with them to let them pet him or really play. I would set up some Play/Visit dates with the family. Todd LOVES kids! They are the best to adventure with. It is always a transition, but see how she interacts with them. My guess…she will run off with the kids and start playing. (Just watch that she isn’t trying to heard them.) You have her best interest in mind, see how she reacts. ***Pro tip: On leash and off leash are 100% different. If at all able I would recommend being off leash for at least part of the visit. She will not feel as much of a need to protect you or freak because she is unable to move away from a stressful situation. At least that is how Todd responds best to new people. Off leash is less stressful for him. I have a red heeler she is really sweet. She does nip at the kids. She goes nuts if the cats walk anywhere in the house. She has the loudest bark which she uses to let us know the neighbors are home, a leaf fell, she’s bored, wants to play, can’t find us ect. Her first year she ate toys, money, entire socks, rain gutters ect. That is better now that she is 11/2. She gets daily walks or hikes. We play Frisbee a few hours a day too. They are great working dogs but if you have kids maybe consider another breed. She is really sweet and protective of us which is nice. I have a blue heeler he is almost 3 years old. Honestly this dog is a good dog but drives me crazy. He is always in your business but tries to take over or jump into what you are doing. If we have a fire he has to bite at the wood my husband puts in the fire. If my husband takes a shower he goes crazy when my husband wipes out the shower. Any kind of motion wheels, etc. he wants to chase. I wish I would have known these things before getting this dog it was quite an adjustment to my life. Hi there! My blue heeler is an Australian Shepard mix, he is 9 years old now this month. I feel like it’s to late to train him since we never did when he was a puppy. He doesn’t have much social interaction due to us living outside the city. What do you think would be the best way to train him? He knows how to sit and lay down, he knows the command ‘come’, he knows how to give me his paw, and he knows the command ‘stay’. I want to teach him more though, like how to crawl, and roll over. What do you recommend? MY BLUE HEELER is a mix of border collie and blue heeler. I am 82 yrs. old and I love, love love her. I named her Gidget and she loves everyone!! I had to go to the cleaners and a toddler there climbed all over her. She was a wild child as a puppy, but I have never been without a dog. After we got through that, she was pretty mellow, but needs a lot of exercise. Fortunately, I still like to hike and bike. She goes everywhere with me and sleeps with me at night. I thank God every day for her. She is healthy, curious, and affectionate and we are very happy together. She also was the brightest dog in the agility class. What a thoughtful gift! I have a 9yr old Blue Heeler/Labrador mix, so she’s on the longer side, though not by much. I just measured her and she’s about 42 inches from snout to tail. Hopefully that helps a little if you haven’t already found that information. Congratulations on your new dog! My healer is 21/2. We live in the country. I walk every day for about an hour. I had surgery on my foot and had to take a year off from my morning walk. My husband took over feeding and treat giving during this time, I have rehabilitated and back to walking in the morning. I have taken back feeding her dinner at night. My husband still feeds treats during the day. My healer has decided she does not want to walk with me anymore. She stays in the fenced yard and watches my husband work on a garage he is building close to the house. I tried putting her leash on her to encourage her to join me. She sits down and tries to get her collar off. What can I do to encourage her to join me and two cats on our morning walk? HELP, a very lonesome walker here. Hi Vicki, please join the forum for help with your dog! We have two. One is a blue female that is 14, the other is a red Male that is ten months. I would suggest trying to walk the dog when your husband is not home, like you are looking for him. Stretch out the walks gradually, trying to always “find” him in the end. It will take care of itself from there. Neither of ours are apt to cooperate if we don’t respect the instinct that is driving the behavior. Creativity, consistency, and lots of positivity are all we ever get results with. I often have to check what is going on in my head, as it will be reflected in the dogs behavior. These dogs are like mind readers. Teach puppy to sit. A sitting dog can’t jump! Also teach long down for impulse control. This takes time and maturity, though, so set your puppy up to be brilliant by keeping pup on a leash during those first exciting ten – 15 minutes of having guests over. Once pup is calm, leash comes off, time to show off “sit” and “down”! Good pup! Also: my heeler requires regular exercise for several days prior to be in his best frame of mind today. When my blue wheeler did that I kept turning when she tried to jump just so my back was to her. She wanted me to face her so she stood and then I give her lots of attention. It actually only took one day to stop the jumping. I have been trying to find out what length (head to tail) a blue healer can be expected (on average) to be. My wife bought one and I’m trying to surprise her by buying a dog bath. For this, dimensions are important. I can find height and weight but never length. These dogs are high energy spaz’s and should not be left in a house for hours at a time as they’ll become visibly depressed and possibly destructive to their surroundings. Under no circumstance should these dogs live in an apartment as they tend to get claustrophobic. Australian Cattle Dogs ideally should be out on the range or farm and don’t make the best domestic suburban/city house dogs unless you are Super Active and I mean Super Active. I have a 5 year old Australian cattle dog and she is fine with our other too dogs except the oldest that was here when I rescued her she tends to pick on but it’s loving but he is an older Shepard lab mix. We just brought in a lost dog and the ospca in this town is horrible. The new pup is about 2 years or so. He’s a Australian sheep dog. She is really mean to him and not dealing the greatest. How do I get her to stop and accept him. I have 2 blue heelers one is going to be 6 and one is 5 years old.. the 6 year old has something against some of my families shoes hell just nip them when they are off their feet.. He came from a bad situation of abuse trying to find out how to get him to stop. My girl is over weight and was in same situation they are brother and sister both fixed any recommendation that they can be trained now??? Stay optimistic, these dogs love to learn. They can read your mind. If you expect difficulty, you will not be disappointed. Hide your shoes where the dog can’t get them, and supply a variety of toys. Be prepared to replace the toys. A lot. The idea is to saturate with things to do. Give that a few weeks, then let the shoes come out. Cheap ones first. Stay with the saturation. Reward good decisions, take the shoes away when there are bad ones. Be gentle, calm, and consistent. These dogs are truly at their best when they are worked with. We have two as well. New learning comes after a walk, and maybe a recap of behavior that has already been practiced. I have a question about a red heeler/German Shepherd mix. When do heelers typically start trying to herd? She is 5 months old and has not shown any heeling tendencies yet. Perhaps she won’t since she is a mixed breed? Any thoughts from anyone who knows more about heelers? We have a 14 week old blue heeler at what time will his ears come up. They seem to be coming up. My Heeler’s ears were flopped over for almost five months. Then one day she woke up and her ears were perfectly erect. They’ve been that way ever since (she’s 9yrs now). I’m answering this way late and your pup’s probably already made the switch, but figured I’d share anyway ? enjoy your Heeler! I love all 4 of my ADOPTEES! DNA tested for health and age, & low & behold, 3 are purebred. Lucky me, in all ways. These are the smartest dogs in the world, and I will not ever parent another. They have my whole heart. 4 is about enough to drive a human crazy, but life is never boring for certain. ?? I have a 6 year old female blue heeler. She is turning white on her back and back legs. Do they start changing colors? Yes they do, if you take regular photos from birth you wont believe its the same dog sometimes.Average age is 12 years she may be getting”grey” in her old age. I would like to know the best DVD to purchase in order to train my blue heeler. He was 1 yr. In Dec. I got him from a neighbor because she did not have the time for him. He hasn”t been neutered or has had any training. Very sweet and smart. Wants to continuously jump on people and gets very excited with loud noises such as large trucks, tractors and lawn mowers. If I let him go he heads up the road and will not listen. I have a hard time getting his attention and keeping it. He is a large healer and very strong. My arms have been scratched several with his jumping. My husband wants to try a shock collar but I don”t. I know I may need to confined him in a fenced area. How do they react with invisible fenced. He is much better after he runs off a lot of his energy. I want to keep him if possible but I also want what is best for him. Dogs wander because they are not happy with the amount of exercise that they are getting. Type (mental and physical) is as important as amount. Treats. We get huge results with treats. Just to be honest, if you sequester and confine this dog it will go nuts. Ours want to everything with us. The young one will get in the shower with me. Everything. The more that you work with this dog, the better it will go.Take the dog somewhere after some exercise so that it can practice, and do it often. These dogs are a lifestyle, but it’s an amazing one. Good luck, and remember that the dog can just about read your mind. Stay positive to your core. They are exceedingly hard to deceive once. Have not seen it twice. Stop listening to people that have no idea what they are talking about. Australian Shepard’s have different colored eyes. Generally a heeler has brown eyes. If the puppy is very young his blue eyes may turn brown. My DNA tested purebred adopted Blue has blue/brown in both eyes. It does not matter. Some have all brown, or all blue or one of each, or one half, or 2 halves, like my girl. They are all unique, and so very special. The merle gene that causes different colored eyes is lethal to cattle dogs. Brown eyes are the standard. I have a question about my blue heeler. She had surgery and her beautiful coat was shaved in two places. Around the middle of her body is growing back slowly. However it’s taking some time around her neck. So I am just wondering if anyone has ever had issues with the coat growing back at all. Thank you for any information that would be helpful in helping this process as well. We just took one in who had surgery and I can’t even tell where they made the incision, much less see any odd spots in his coat. Hopefully that means the hair on yours will come in after a while. We have a rescue with a large scar down her back. It appears to be fairly old (she’s 2yrs old) but no sign of hair growth on the scar areas. My girl was spayed a year and a half ago and the hair never grew back. I don’t mind because it’s on her stomach and you can’t see it. But I think this area is different than being on the top of her coat.